The number of older prisoners in prison populations is growing in many countries, in part due to ageing populations and often in part to punitive sentencing policies. However, older prisoners are more likely than their peers in the community to be disabled, to have multiple, costly chronic health conditions, and experience age-related cognitive impairment including dementia, presenting new and pressing challenges to the delivery of healthcare in prison systems. In the tenth expert blog in our anniversary series, Cyrus Ahalt and Brie Williams, Directors of the Community Ageing Health Project at the University of California, San Francisco, discuss the implications of the growing number of older prisoners for health-related policy and practice across criminal justice systems from arrest to reintegration, and argue that policy-oriented research is urgently needed to address the needs of this vulnerable group. Population aging has emerged as the most dramatic and challenging demographic trend in the US criminal justice system. In 1992, the first of the US’s post-WWII “baby boom” generation entered its middle age, new “tough on crime” strict sentencing policies were introduced, and 2.5% of US prisoners were age 55 or older. In 2008, when the US. prison population reached its peak, the proportion of older prisoners had reached 5%. By 2012, it doubled again. Today, nearly 1 in 10 US prisoners are age 55 or older; an additional 15% are 45-54 years old. And because population aging and increasingly punitive criminal justice policy-making are essentially world-wide trends, the aging prisoner phenomenon is global. This demographic trend is having a particularly great impact at the intersection of criminal justice and health. Prisoners are considered “older” at age 55 because behavioral health risk factors and poor prior access to healthcare are common among prisoners, meaning that the average prisoner’s physiological age is often well advanced of his or her chronological age. Such “accelerated aging” means that older prisoners are more likely – compared to both younger prisoners and age-matched community dwellers – to be disabled, have multiple, costly chronic health conditions, and experience age-related cognitive impairment including dementia. As a result, the growth in the number of older prisoners has unique and pressing implications for health-related policy and practice across criminal justice systems: at arrest and adjudication, throughout detention, and during community re-entry. As the population ages, a growing proportion of US arrestees are older, yet staff who interact with older adults entering the criminal justice system are rarely sufficiently trained to identify and respond to health-related concerns. For example, older adults may suffer from sensory impairments (such as vision and hearing loss) that make it difficult for them to comply with police officers during an arrest, adequately participate in their own defense at adjudication, or avoid victimization while detained. Identifying sensory impairment is not always easy as some older adults hide impairments fearing that disclosure will increase their vulnerability. Similarly, substance misuse, depression, anxiety, and cognitive impairment are all common in older adults but may be particularly difficult to differentiate in the criminal justice population, particularly for police officers, attorneys, or correctional staff in pre-trial detention centres who are not trained in aging-related health. Each of these health concerns has unique relevance when adjudicating an older arrestee. For example, odd behavior leading to arrest can be the result of early dementia. Diagnosis and intervention by trained medical staff is required to interrupt the cycle of repeat arrest. Yet many older arrestees who show only subtle signs of underlying cognitive impairment are not assessed by a geriatrics specialist and, according to the US Institute of Medicine, non-health professionals in the criminal justice system are generally unprepared to identify the health-related needs of an aging population. Our team at the University of California, San Francisco has founded The Community Aging Health Project, which develops and delivers targeted geriatrics education to criminal justice professionals, including police, lawyers, judges and clinicians. We have found great interest in geriatrics training throughout the criminal justice system. But national and local leadership, development of targeted and engaging curricula, and program evaluation are all needed to prepare our criminal justice workforce for an aging population. Another option to improve outcomes for older adults is to divert those who might benefit to treatment-based alternatives to incarceration. Criminal justice-involved older adults are disproportionately sick and disabled and old age itself predicts a lower likelihood of crime and recidivism. In addition, incarceration poses unique health risks to many older adults, who are disproportionately susceptible to falls, depression, and victimization by younger inmates. Thus, the opportunity to save money and improve outcomes for older adults via treatment-based alternatives to incarceration is considerable. In the US, the “elder court” concept – a special court that, like successful drug courts for persons battling addiction and veterans courts for veterans, could link older adults with legal and social services staff trained in geriatrics before adjudication – is slowly catching on. But such courts’ focus is typically narrow, hearing mostly cases where the victim is older. In coming years, increased funding and research is needed to develop programs that serve the growing number of criminal justice-involved older adults with considerable health and health-related needs that pose minimal threat to public safety. The list of priority areas in need of address to ensure that the basic health and human rights of older prisoners are met is long. Every prison or jail facility should have at least one medical provider who is trained in geriatric assessment. Adequate care of older prisoners requires knowledge of the sensory, functional, and cognitive impairments affecting prisoners’ health and wellbeing in the prison environment. Injuries caused by falls, worsening function related to deconditioning, physical and emotional suffering resulting from fear of victimization are just three examples of significant adverse health consequences that could be avoided if older prisoners are properly assessed and their living environment is adequately matched to their level of need. Environmental adaptations to older prisoners’ sensory, functional, and cognitive abilities are often simple but important; for example, removing older prisoners from top bunks, providing separate shower times and making shower chairs available during those times, or systematically alerting correctional staff to prisoners with a confirmed hearing impairment. Other, more complex policy responses may be considered once a facility understands its older prisoners’ needs. In the “California Men’s Colony” prison, a program that trains younger volunteer prisoners to assist their fellow inmates with dementia has improved care for some older prisoners while creating a rehabilitative experience for younger prisoners serving as caregivers. Here and elsewhere, the first step towards innovative solutions to meet the needs of older prisoners is assessment. The potential of specialized geriatric housing units as a means for improving the care and safety of older adults continues to trigger debate in the US. Though such units are designed to be more closely aligned with older prisoners’ functional abilities, geriatric housing units can be isolating for a population that is already most likely to suffer depression and anxiety as a consequence of isolation inside prisons and declining social connection to the outside community. Optional access to geriatric housing units with the same level of programming and health care as in general housing units may be optimal but further research, informed by prisoner perspectives, is needed to understand the costs and benefits of a separate geriatric housing model. An important area of in-custody care for older prisoners is in prison-based hospice care. “Hospice” is care that focuses on people who are actively dying, typically those who have been given a prognosis of 6 months or fewer to live. There are over 75 in-prison hospice units in the US, the majority of which employ trained prisoner volunteers to provide dying inmates with support in daily activities, help completing paper work, companionship, and assistance communicating with medical providers, family members, and others. Many view in-prison hospice units as both cost-saving and as essential to respecting the human rights of dying prisoners. However, there are considerable challenges in the effective provision of quality care to prisoners with serious illness. Hospice is the last stage of palliative care for dying persons. “Palliative care” is care that focuses on providing guidance and symptom management to seriously ill persons and may be given concurrently with curative care. In the US, palliative care programs are far less common throughout criminal justice systems than are hospices. With an aging population, all clinicians should have training in palliative care, including in how to talk to patients about serious illness, how to manage severe symptoms in patients with a history of substance abuse, and how to discuss goals of care with patients who have limited literacy and/or social support. Second, Prisons implementing a hospice or palliative care program should anticipate, and develop policies to respond to, the patient-provider mistrust that is a common feature in correctional healthcare systems. Here, the use of palliative care in-reach services, volunteers, and patient advocates and mediators may be helpful. Third, policies around pharmacological treatment of pain and other symptoms may need to be revisited to meet the needs of seriously ill prisoners. While additional research is needed to determine best practices in prison-based hospice and palliative care, the current literature is rich with examples of innovative programs that are wrestling with these and other challenges, making this an area where a larger spotlight among correctional healthcare practitioners and policy-makers could generate new and innovative solutions. It must also be noted that a considerable number of prisoners who die in custody – though not all – pose minimal to no threat to public safety once their illnesses and/or disabilities progress beyond a certain stage. US law acknowledges this reality in the availability, in many jurisdictions, of compassionate or medical release that allows for prisoners to die in the community if certain criteria are met. (These criteria differ across the jurisdictions with such statutes.) However, medical release provisions are infrequently used in the US, often because a single criterion for release is not met despite a patient being a logical candidate for release (for example, in the case of a prisoner who is physically and mentally incapacitated yet does not have a prognosis of 6 or fewer months to live). In the US and abroad, there is great potential to reduce unnecessary spending and increase the likelihood that seriously ill and dying prisoners receive the care they need by implementing sensible, accessible medical release policies. However, such policies are often politically fraught. Here, evidence based partnership with the medical community is essential to achieving better outcomes for seriously ill prisoners. The literature on older prisoners is scant in describing what happens upon release from prison or jail. We do know that poor health is associated with poor transitional outcomes for former prisoners of all ages – for example, making it harder for recently released prisoners to secure employment, obtain stable housing, and reconnect with social networks. These challenges are likely greater still for older adults released after serving long sentences as they are faced with reintegrating into communities that may no longer be familiar to them. Indeed, studies show that community-based support networks steadily dissipate the longer that prisoners are incarcerated. Health-related re-entry programs for former prisoners, many with wrap-around medical and social services, are increasing in number. Such programs exist to meet the needs of formerly incarcerated juveniles, veterans, drug addicts, adults living with HIV, women with children, and others. Similarly, team-based geriatrics care that provides medical and social services to socio-economically disadvantaged older adults living in the community are emerging. To our knowledge, no such programs specifically target older adults during re-entry. Yet, these older adults are likely to have unique needs compared to both younger prisoners returning to the community and socio-economically matched older adults without a criminal justice background, including problems related to institutionalization, social isolation, chronic disease, physical disabilities and cognitive impairment. In the US, over 95% of prisoners are eventually released. As a growing proportion of these former prisoners are older, more research, evaluation, and funding for innovative programs to meet these patients’ needs will be needed. The older population – and with it, chronically ill, seriously ill, and disabled prisoners – is the fastest growing demographic group in criminal justice systems from the US to the UK to Japan. Older criminal justice-involved adults represent a diverse and complex population that requires specialized assessment and intervention at each major stage of criminal justice involvement: arrest and adjudication, detention, and transition back to the community. Without a rigorous, targeted approach to this population, the number of medically vulnerable older adults cycling in and out of incarceration at great cost to public health and criminal justice systems – as well as to the well-being and dignity of these individuals – will continue to grow. In the US and elsewhere, better training and assessment tools, improved policies, and expanded investment in geriatric-focused education and alternatives to incarceration have the potential to place older adults in programs capable of doing the hard work needed to keep them from future arrest by treating their underlying medical and social problems. Of course, many older adults who arrive in the criminal justice system are adjudicated appropriately and are held in custody as is needed to preserve public safety and achieve the rehabilitative and restorative goals of incarceration as determined by their communities. Yet, if the conditions of confinement are not calibrated to account for these older adults’ medical realities, we risk administering a punishment that is unduly harsh and well outside our societal definition of justice. Further, if adequate resources are not provided to ensure that older adults have every opportunity to successfully reintegrate into our communities after serving their sentences, we risk continuing a costly and avoidable cycle of recidivism linked to worsening physical and cognitive health. In the US and abroad, responding to the many interwoven challenges posed by aging arrestees and prisoners is a significant effort policy-makers, scholars, and professionals in the field can make towards averting looming fiscal and human rights crises in the provision of criminal justice. 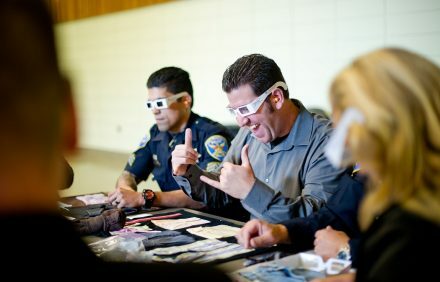 Photo (above): Training by the Community Aging Health Project designed to help police officers understand what elderly arrestees and detainees might be going through. Cyrus Ahalt, MPP, is the former Co-Director of the Community Aging Health Project at University of California, San Francisco (UCSF). He has conducted research at the intersection of geriatrics, criminal justice, public health and health policy. Currently, Mr. Ahalt is the Program and Policy Analyst for the San Francisco Collaborative Courts In California. Brie Williams, MD, MS, is an Associate Professor of Medicine in the Division of Geriatrics at University of California, San Francisco (UCSF) where she conducts policy driven research to understand the healthcare needs and improve the health of criminal justice-involved older adults. She also serves as Director of the Community Aging Health Project and Medical Director of the San Francisco VA Geriatrics Clinic. Dr. Williams has published work calling for more evidence based and effective use of compassionate release policies for prisoners, broader inclusion of prisoners in national health datasets, better funding for criminal justice healthcare research, and improved systems for defining, recognizing and responding to functional impairment, cognitive impairment, and multimorbidity in incarcerated older adults. She uses the results of her research to help system leaders, policy and law makers shape correctional healthcare policies. Podcast: How can criminal justice systems from police to probation address the medical and social care needs of elderly prisoners?